When I started at Palantir, I got a crash course in data analytics. In the process, I've realized that pure software engineering skills are just one piece of a broader set of tools needed to interact with data in sophisticated ways. For a software engineer that works with data regularly, some basic data analytics go a long way to being more effective on your team. In this post, we'll deal with one of the simplest yet most powerful forms of data analysis: time series. Time series data is data that demonstrates how things change over time. For example, you might use time series to plot stock prices or income growth, or any other metric for which the x axis is time. At the end of the post, I've also included a simple function you can use to analyze the comparative performance of any two stocks using existing APIs. Today, we're going to pull a couple of datasets from Quandl, a tool that exposes stock ticker and other data for analysis. Some of their datasets are expensive, but others come for free. We'll use a couple of the free datasets today to do the analysis. To plot the data, we'll go ahead and use plotly in a Jupyter Notebook. For instructions on installing Jupyter (a great tool for these analyses), go here. Obviously, data analysis of this sort doesn't serve much of a purpose if we don't have the right questions in mind. Oftentimes, we may want to see how one variable is impacting another or how two variables compare over time. Below are a few of the questions we may want to understand. How did the performance of two equities compare over time? How did rising GDP affect consumer discretionary spending? What trends can we extract by looking at a local real estate market? 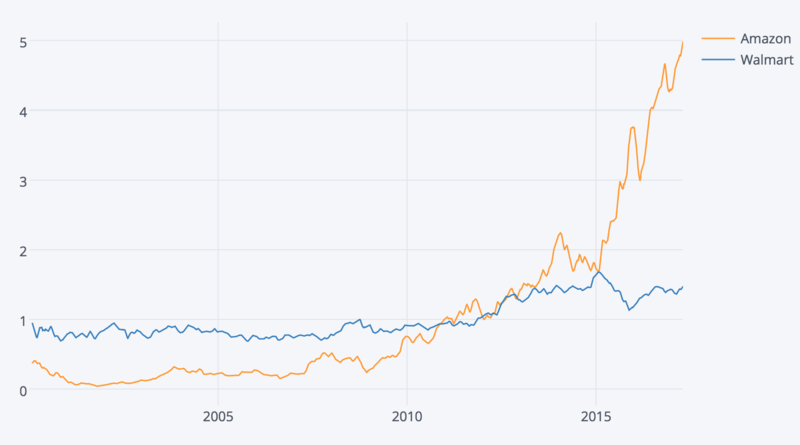 Today, we're going to dig into the following: How has the growth of ecommerce stocks compared to the performance of brick-and-mortar stores over the past 10 years? To address this, we're going to pull some stock data from Quandl. The first step to any analysis is loading your data into a place you can analyze it. This could take the form of a loaded excel spreadsheet, hitting an external api, loading a CSV into Pandas, or some other method of getting data into your analytic environment. Now that we've imported all our tools, it should be easy to load the right stocks. 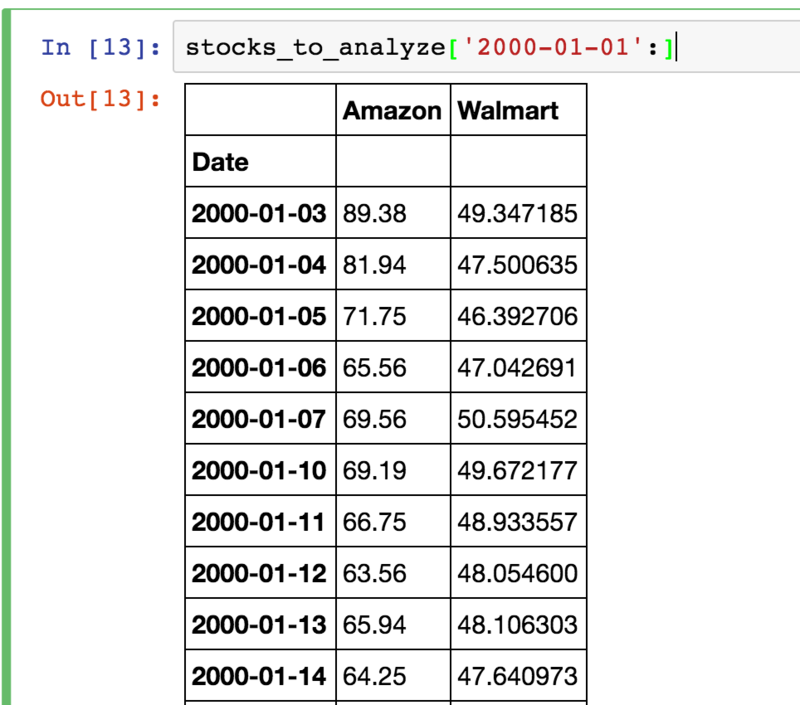 We're going to quickly load a few historical stock prices from Quandl: Amazon and Walmart. Step 3: Plot, Transform, Plot, Transform..
Now that we've loaded our data, we can take a crack at plotting it. Time series data has a few quirks that come into play when plotting. Our two companies went public at different times. Therefore, we have more historical data for Walmart. Their magnitude is completely different. We want to see their trends from a comparative perspective, so this often proves problematic. That's slightly better, but we still need to deal with issue (2). We can easily index data using pandas. An index is a way to measure direct changes in a value based on distance to the mean value. 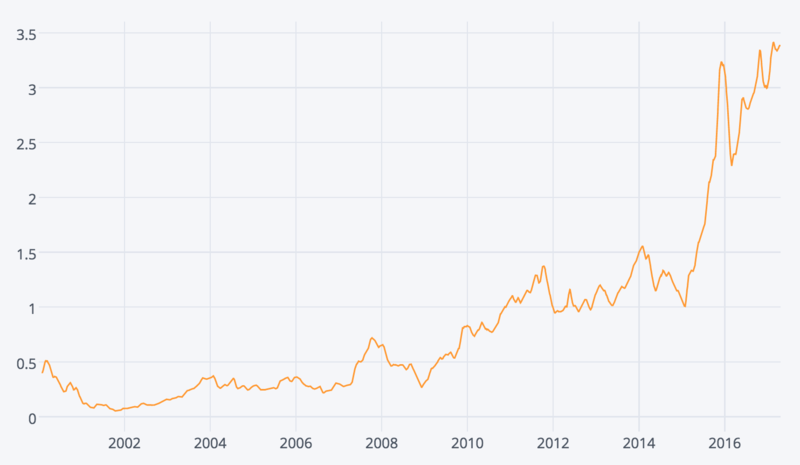 In time series analysis, we can use it to put Amazon and Walmart's stocks on a similar scale. This is a nice step in that it makes our picture a lot more clear. We can actually see that Walmart was growing during this period, although it obviously was not matching Amazon's massive growth (nor could we expect it to). At this point, we've done a fairly nice basic plot, but let's smooth out our lines there. Currently, we're analyzing every day's worth of data. To smooth out this curve, let's apply a moving average to the graph. A moving average (AKA rolling mean) is essentially a window of data in which a group of values is used to plot the value for a given day. For example, plotting a rolling mean of 3 days would mean that today's measurement would really be an average of todays, yesterdays, and the day before. This has an incredible effect when visualizing time series data. It serves to completely smooth our curves based on the size of the window. It's also incredibly easy in pandas. Tip: When calculating a moving average on datasets in which you have weekly measurements, try using a window size that is a multiple of 7. This will adjust for weekly variations. For example, sales might pick up on the weekends, so you'll want to make sure you're including a full week each time. The impact on our graph is immediately apparent. We have eliminated a great deal of the noise here and can much more readily assess stock performance. This might be enough to go show someone what we've found, but we can actually take it a step farther to compare the performance of the two stocks directly. 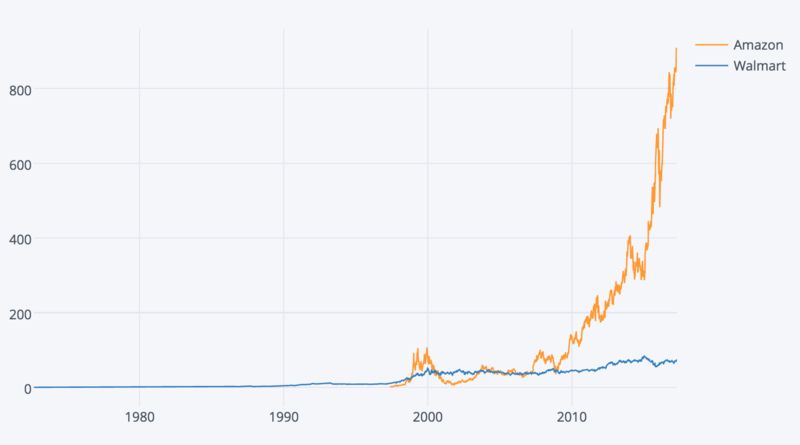 By taking our two precomputed indices and comparing them as a ratio, we can actually get a more direct sense of the magnitude of Amazon's massive outperformance of Walmart's stock. If the stocks performed at exactly the same level, we would expect this line to stay roughly flat. 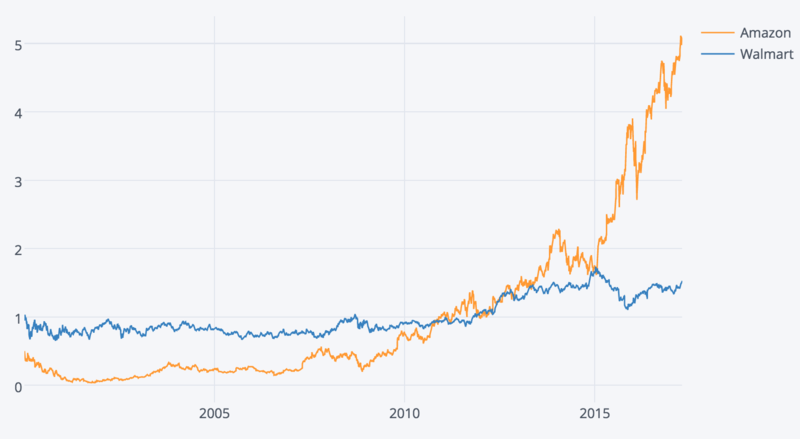 If Walmart were outperforming Amazon, it would go down, and if Amazon were outperforming Walmart, it would go up. 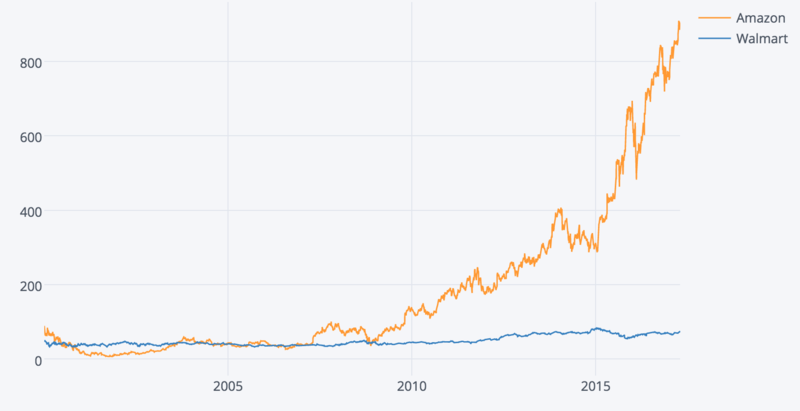 This is great and all, but at the end of the day, is it really a surprise that Amazon (a fast-growing, volatile stock riding a wave of ecommerce) outperformed an entrenched giant like Walmart? Probably not. It would be great to not have to do all of our work again, though, if we wanted to compare another 2 (or 10) different stocks. One of the best parts of Python analytics, then, is the ability to quickly parameterize all of the work we just did. Below, I have included a function that will, given any n stocks found in Quandl's WIKI dataset, index and plot the data for any date range. Feel free to use it in your projects! Obviously, time series is just one way to evaluate a data source, but it is a great first step in making sense of your data's quality (i.e. revealing outliers, gaps, etc.) and also understanding historical trends. Next time, we'll dig into more advanced analytic techniques such as regression and correlation! Since 2015, Natalie has worked as a software engineer at the intersection of policy, privacy, and technology at Palantir Technologies. All views expressed are strictly her own. "That sounds...interesting" is a pretty common response when I explain to people that "I spend a lot of time working on logging, and no really, it's quite exciting." Yet I can never seem to drive home just _why_ I find logging so fascinating as an area of technical inquiry. Why Does it Matter if I'm Watched?